Causal loop diagrams can help in tackling complex issues effectively. Until the nineteen-seventies the literature focussed on the technique of such diagrams. Since then it has become evident that participation of stakeholders in making and applying such diagrams is desired to affect change. The point is that you don’t learn as much from reading a causal loop diagram as from you do from making it. Applying acquired insights or accelerating decision-making also imply a need to work interactively with diagrams. This means that change agents should not only be able to make diagrams, they should also be able to design and facilitate the participation of parties concerned. There are various ways of doing this. It depends on the goals you are using the diagrams for, and how you translate them into the phases of diagram formation and application. With wicked problems you also find intervention paradoxes playing an important role. This chapter introduces several mental frameworks that help change agents shape the interactive process and facilitate it effectively.. Case histories are used to illustrate contrasting processes that may result from this. I hope it may contribute to a broader use of causal loop diagrams so that systems thinking, besides just being a popular idea, becomes a craft in our organizations. The chapter can be downloaded. It does not cover the technical side of causal loop diagrams. There is another text available that covers both the technical and the intervention aspect of such diagrams in a more condensed version. 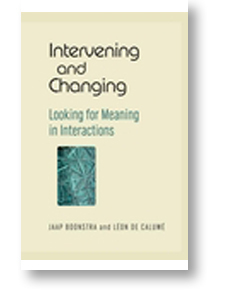 The text is a contribution to a book edited by Jaap Boonstra and Léon de Caluwé. The book introduces a new perspective on intervening in organizational change. It offers an overview of paradoxes in the field of organizational change and presents interventions, which are based in social constructionism and social interaction theory. From this perspective people are collaborating together, making sense of their work and living situations, building new futures and developing collaborative action for breakthrough innovation. It is a comprehensive guide to new ways for organizations and communities to achieve innovations. It offers an overview of currend knowledge and the dynamics of organizational change and learning. A wide range of interventions is described with case examples and advice on how to apply them for consultants, managers and academics alike.